Electric car charging network ChargePoint has established its first presence in Atlanta in a deal announced on Monday with Lanier Parking Solutions. This adds six charging stations to the Atlanta metro region, an area that appears to have either Blink or independently owned stations. The stations are located in Downtown, Midtown, and Buckhead locations. 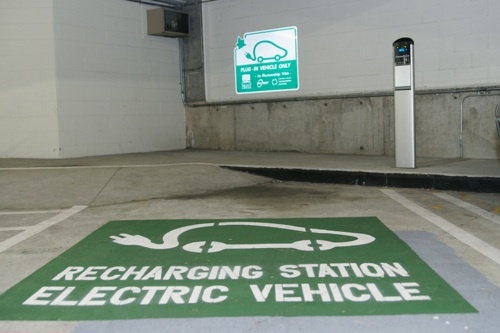 A seventh charging station is planned but the location is not yet known. Three of the stations are at the PeachTree center in the Downtown area. Another is in the Georgia Pacific Center, also Downtown, and two others are at the Ponce City Market, on Ponce de Leon Ave, NE, and at the Prominence in Buckhead. All these locations are in the northern half of Atlanta, and on the PlugShare map the preponderance of electric car charging stations are north of I-20. That makes one wonder about the demographics of Atlanta that the northern half of that metropolitan area has more electric car charging stations than the southern half. There are more than 750 electric and electric hybrid vehicles registered in the Atlanta area. Because automakers are introducing several new models in 2013, the number of registered plug-in vehicles is expected to increase. ChargePoint is one of the two major charging station networks in the country, the other being Blink. Blink's expansion into Atlanta came in August 2012.